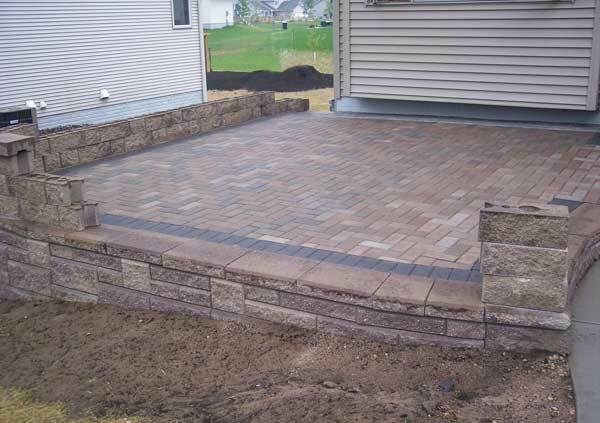 An Allan Block raised patio may be just what your project needs. You can incorporate curves , corners or even stairs into your patio design. 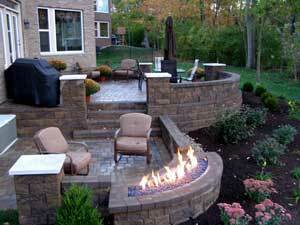 Building a raised patio is easy and can add more usable living space and lasting value to your landscape. Once you have determined the location and design of your raised patio, stake out the location and use a string line or paint to mark out the area. A garden hose is an excellent tool for marking out curves. Then excavate the area by removing all the surface vegetation and organic materials from the area. These cannot be used as backfill material. Starting at the lowest point dig a base trench 24 in. (600 mm) wide by 6 in. (150 mm) deep plus 1 in (25 mm) deep for each 1 ft. (300 mm) of wall height. Compact the base trench as well as the entire patio base area, making a minimum of 2 passes with a walk behind plate compactor. 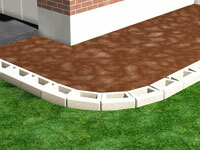 Compaction of these areas are very important as they make up the foundation of both your wall and raised patio. 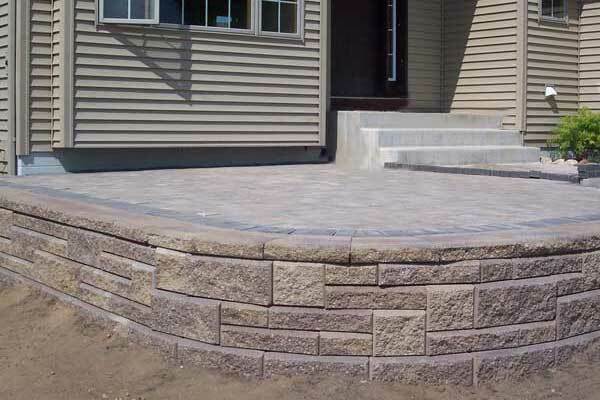 Like any other Allan Block retaining wall, your raised patio needs to have proper drainage. A drain pipe is used to prevent water pressure from building up behind the retaining wall. Place the drain pipe at the back of the trench and vent to daylight at the lowest point. In addition to managing the water the drain pipe, you will need to manage the water flow around the house foundation (if you are building against a house). To do this you will need to waterproof the foundation wall. Check with your local building officials or with the material manufacturer on recommended installation of this waterproofing material. 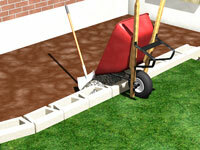 To begin building the retaining wall that will make up your raised patio, start by preparing the base. Place the required amount of wall rock in the base trench and rake smooth. Compact the entire trench, then check for level making adjustments as needed. Starting at the lowest elevation, place the blocks on the base material near the front of the trench. Check each block for level and alignment as it is installed. Make minor adjustments by using a dead blow hammer or by placing up to 0.5 in. (13 mm) of course sand under the blocks. Keep in mind irregularities in the base course become larger as the wall stacks up, causing your patio to be uneven. Paying extra attention to your base will ensure your wall is level. Fill in the area in front of the blocks with on-site soils. This will keep the blocks from shifting while filling and compacting. Fill the hollow cores and 12 in. (300 mm) behind the block with wall rock up to the height of the block. 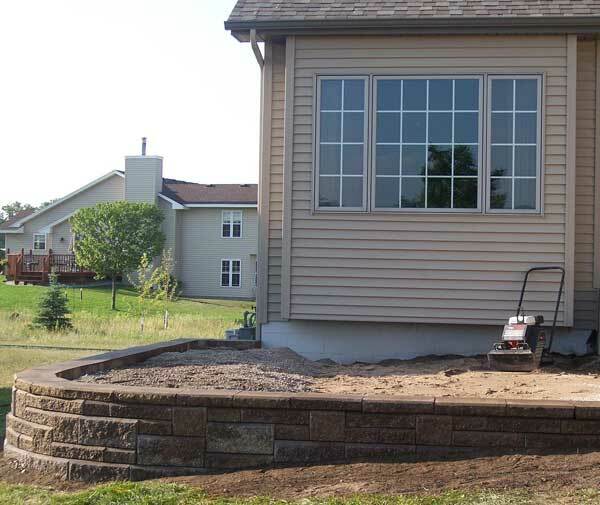 Fill in the area behind the wall rock with approved materials for below your patio. Use a compactable rock or sand behind the entire wall. This provides a fill that is less likely to settle over time. Compact the entire area behind the blocks making a minimum of two passes with a walk behind plate compactor. Next, remove all excess material from the top of the blocks and stack your next course. Check for level and alignment and adjust as necessary. Then backfill the entire area behind the blocks and compact in lifts of 8 in (200 mm) or less. Make sure to use wall rock in the block cores and directly behind the retaining wall. From the second course and above, use a plate compactor to compact directly on top of the blocks as well as the rest of your patio area. Once the walls of your raised patio have reached the proper height it is time to place in your patio flooring. Choose a flooring option like concrete, pavers, brick or natural stones to fit the design and style of your landscape. Depending on your choice of pavement, the final course of your wall may be backfilled differently. Check with the manufacturer of your patio flooring for proper installation instructions. Allan Block’s raised front lip provides a perfect edge for AB capstones, or pavers. 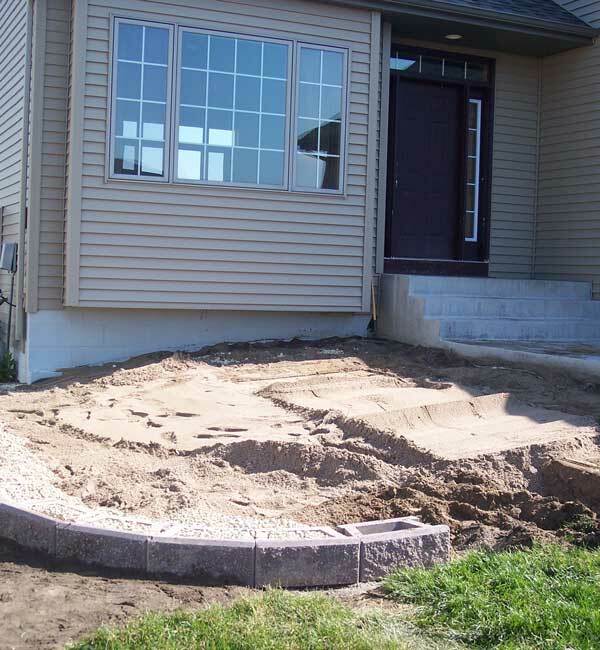 Keep in mind, a slope in the patio surface is needed to allow water and runoff to drain away from the house foundation. While a typical slope of 2% is recommended for driveways, patios can be set at a 1% slope. This will provide the balance and comfort for patio users, while still allowing for proper drainage. Now your beautiful raised patio can be finished off with with the AB Courtyard Collection by incorporating seating walls or even a pergola. **Taller walls may require additional reinforcement. See the retaining wall installation guide to determine if your wall will require additional reinforcement.